In this adaptation of the autobiography "The Pianist: The Extraordinary True Story of One Man's Survival in Warsaw, 1939-1945," Wladyslaw Szpilman, a Polish Jewish radio station pianist, sees Warsaw change gradually as World War II begins. Szpilman is forced into the Warsaw Ghetto, but is later separated from his family during Operation Reinhard. From this time until the concentration camp prisoners are released, Szpilman hides in various locations among the ruins of Warsaw. 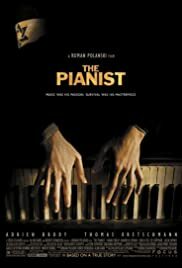 The Pianist tells the story of such a man in war time Poland, played by Adrien Brody, who from start to finish sees his life literally getting worse and worse and worse- starts off with new rules from the Nazis, then the stars on the arms, followed by the Warsaw ghetto, and while there he could play in the restaurant, that too soon ended, as the trains arrived and took his family and anyone else he knew away. During this he narrowly escapes, and from then on the film in a sense almost becomes not exactly a holocaust film, but more like a cross of that as the element and the basic structure of something a-la in Cast Away: this includes stretches of scenes showing Brody simply trying to keep out of view of the Germans, either in a small apartment provided by helpful Polish Christians/Jewish resistance, or as a scavenger in the abandoned sections of the ghetto, all while feeling the old rhythm of the piano in his head and fingertips.